Yorkshire Terriers are intelligent, spirited and alert. Patient training and early socialization will reduce the Yorkshire Terrier's tendencies towards timidity and nipping. One of the world's smallest dogs, this affectionate breed is always willing to please. Don't let their size fool you... Yorkies are beautiful and they know it! The Yorkshire Terrier originated in England. Yorkshire Terriers range from eight inches to nine inches. Yorkshire Terriers range from three pounds to seven pounds. Yorkshire Terriers are typically blue-black or tan. Yorkshire Terriers have a long, silky coat. 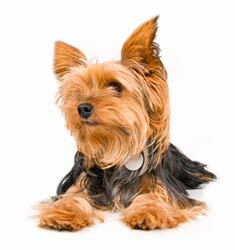 Daily grooming is essential to keep the Yorkshire Terrier's coat clean and fee of tangles. The Yorkshire Terrier is a "big dog in a small dog body," ready for adventure. Affectionate with its owners, the Yorkshire Terrier can be timid around strangers and dislikes roughhousing. The Yorkshire Terrier is susceptible to eye irritations, tracheal collapse, premature dental disease and patellar luxation. The expected life span of the Yorkshire Terrier is 14-16 years. Yorkshire Terriers are less active than their larger terrier cousins and needs little exercise to remain happy. An excellent apartment dog, a walk each day will provide ample exercise for this affectionate breed. The Yorkshire Terrier is in the Toy group. 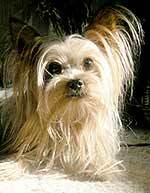 Known as the Yorkie to all who love them, this lovable member of the toy group is very intelligent, loving, and loyal. The Yorkie has no real desire to be the alpha dog in the pack, so he is an ideal dog to add to a family which already has other pets. His small size makes him ideal for apartment living. They are described as confident, vigorous, and self-important in the breed standard, and most Yorkies fully live up to this description. Although they may be a bit skittish around younger children, they bond quickly and deeply with older children and adults. The Yorkshire Terrier is a very small dog of no more than seven pounds, usually standing 8 to 9 inches tall. The breed standard doesn’t distinguish between different sizes of Yorkies, meaning there is no separate standard for so-called Teacup Yorkies. They have long hair in a single layer that continuously grows and rarely falls out. Shedding is minimal and is normally seen only when the dog is brushed. In addition, Yorkies carry less dander on their coats than some other dogs, making them one of the dogs recommended for dog-lovers who have allergies. 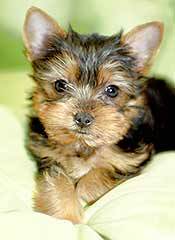 At birth, Yorkies have a puffy black and tan coat, which matures into glossy, fine, silky hair. From the back of the neck to the base of the tail, the adult coat is a dark steel blue, while hair on the tail is a darker blue. Tan hair covers the head, chest and legs, and is darker at the roots than at the tips. In a show-quality dog, great emphasis is placed on the coat’s texture and coloration. Straight, silky hair is a must, and the colors should show a definite demarcation between the tan and blue portions. The coat is kept long, parted down the middle of the back for show, but may be cut to floor length or in a general puppy cut in pet Yorkies, depending on how much time you have available for grooming. If you plan on showing your dog, you must also plan on spending hours each day brushing his long hair to prevent tangles. Between shows, the coat is often oiled and wrapped in rice paper or tissue paper to keep it healthy. The wraps must be re-done quite often to prevent them from breaking the hair, and the oil must be washed out and replaced weekly. The good news is that if you are not showing your Yorkie, maintenance is much easier. Some Yorkies go to the groomer every six weeks or so for a clipping, keeping the hair short all over in a style known as a puppy cut. Others carry floor-length hair that is maintained with regular trimming either at home or by a groomer. The hair on the feet and around the tips of the ears is also trimmed to make daily grooming easier. 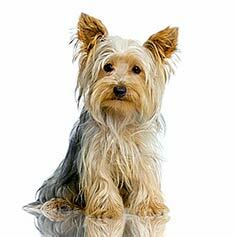 To keep the coat in good shape, the Yorkie should be brushed daily and bathed at least once a month. As with most dogs, Yorkies benefit greatly from early socialization. This early conditioning will help assure that your Yorkie maintains his natural outgoing, bold, and friendly attitude. Without early training, some Yorkies become aloof, timid, or nervous. The best way to encourage your Yorkie to like people is to make sure he is around a variety of people at every opportunity. To the extent possible, take him with you everywhere you go for the first several months after he joins your family. Obviously, you can’t leave him in the car alone, but you can take your spouse, a friend, or one of your children with you when you run errands and leave the puppy with that person outside the store while you run in to complete your shopping. If you are going to your kids’ ballgames, bring the dog along. Find some shade and make sure you provide plenty of water, but let the kids come and play (gently!) with the puppy to get him used to being around children. Walk him daily, both to get him used to the leash and to let him become accustomed to the people in your neighborhood. 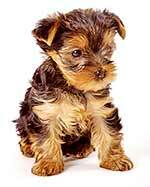 Housebreaking and obedience training for the Yorkie is also similar to that for other dogs. Consistency is the name of the game. Remember that you are the alpha dog in your family, and simply insist that your puppy learn and obey your rules every time. Most puppies benefit from an obedience class, even if you have already attended with previous dogs and know how to train the dog. Taking your puppy to class provides another socialization opportunity for him. Yorkshire Terriers originated in Yorkshire, a county of northern England, at the peak of the industrial revolution in the mid-19th century. Miners and mill workers from Scotland came to England in search of work, bringing with them several small long-coated terriers to hunt vermin. Although the exact ancestry of the breed isn’t known, it is thought that the Yorkie’s small stature, long hair and blue color are from the Clydesdale, Paisley, and Skye terriers of Scotland, while his color patterning is likely from the English Black and Tan Terrier. Very rarely in the annals of dog breed ancestry is there agreement on the beginnings of a breed. However, for the Yorkie, it is universally accepted that the modern breed sprang from the loins of Huddersfield Ben, a dog born in 1865 in the town of Huddersfield, county of Yorkshire. Although he died at the age of 6, he won 70 prizes at dog shows and was an exceptional ratter. He single-handedly brought the breed to popularity in England. The Yorkie was brought to the United States in 1872 and was one of the first breeds approved for registration by the American Kennel Club. The dog was popular with those in America who followed the customs of Victorian England, but his popularity fell in the 1940’s. During World War II, a famous war dog named Smoky saved the breed from obscurity. Yorkies are often bred with other small dogs, in hopes of creating a cross-breed that will be hypoallergenic. Sometimes this works, but often it doesn’t. Breeding a Yorkshire Terrier with a Poodle, creating what is known as a Yorkie-Poo, is a fairly reliable way to get a dog that doesn’t shed, as neither of the parent breeds is a heavy shedder. Varying levels of success have been found by mating the Yorkie to the Maltese (creating a Morkie) or by mating the Yorkie to the Miniature Pinscher (making a Yorkie Pin). It should be noted, however, that the shed fur is not what most commonly causes allergic reactions to dogs. Rather it is a reaction to the dog’s saliva and dander. Dander, composed primarily of dead skin cells, falls off of the dog regardless of whether or not the dog is losing hair. Due to their small size and sleek good looks, the Yorkie has been featured in many films from Funny Face to A Fish Called Wanda to the High School Musical series. The breed has also appeared on TV in such series as Green Acres, Lou Grant, and The George Carlin Show. Yorkshire Terriers have enriched the lives of countless celebrities, including Tricia Nixon, Britney Spears, Audrey Hepburn, Joan Rivers, Justin Timberlake, Bruce Willis, Brett Favre, and Raven-Symone. If you are looking for a small, beautiful dog with minimal shedding, the Yorkie may just be the breed for you. However, make sure you are committed to the time the breed requires for grooming before you make a commitment to this dog. He may live as long as 15 years, so you need to be sure you are willing to provide excellent care for him over the long haul. Find Yorkshire Terrier Puppies with our Free Breeder search!